Objectives: This paper sought to determine if there were an association between drain placement and the incidence of wound complications. Materials and Methods: A single-center institutional review board-approved retrospective study between 2001 to 2008, comparing 680 kidney transplant patients who either had a drain placed or were left undrained. Linear regression modeling was used to adjust the risk factors between the groups. Patients received calcineurin inhibitors, steroids, and a mycophenolate formulation. The incidence of early major and minor wound complications were captured. Minor wound complications were defined as seroma, lymphocele, and perigraft fluid collection, and major wound complications were defined as wound dehiscence, hematomas, evisceration, infections, wound necrosis, and hernias. Patients with incomplete data or those taking sirolimus were excluded. Results: Six hundred eighty kidney transplant cases were reviewed. Four hundred seventy-nine received drains; 201 did not. Demographic analyses revealed that the drain group had a higher average value in age and body mass index. The drain group had a lower albumin and a lower mean platelet count after surgery. The number of patients without diabetes in the drain group numbered nearly twice as many as did those without drains. An attempt was made to statistically account for demographic differences. Seventy-eight of 479 drained patients (16.28%) and 24 of 201 no-drain patients (11.94%) had a wound complication. Minor wound complications were observed in 9 patients (1.88%) in the drain group and 6 in no-drain group (2.99%) (P = .3702). Major wound complications were observed in 58 patients in the drain group (12.18%) and 17 in the no-drain group (8.46%) (P = .1655). Drain placement had no effect on major or minor wound complications. Conclusions: Drain placement is not associated with major or minor wound complications in kidney transplants. The discovery of an association between sirolimus and increased rates of wound issues has caused many transplant surgeons to return to the practice of drain placement to decrease wound issues in all recipients. Placing a drain after the kidney transplant operation may help reduce lymphocele formation by decompressing the surgical site and preventing the collection of fluids in the surgical cavity, which can cause wound breakdown, DGF, and hernia formation.1,14 Drains are used to monitor postoperative bleeding and urine leaks. Placing a drain has been shown to cause wound infection, and therefore, may place an immunosuppressed kidney transplant patient at increased risk.22-29 This study sought to determine whether drain placement has any effect on major or minor wound complications in a sirolimus-free regimen of a calcineurin inhibitor, MMF, and a steroid. This is a single-center institutional review board-approved retrospective study of all kidney transplants performed from 2001 to 2008 at Albert Einstein Medical Center. All protocols conformed with the ethical guidelines of the 1975 Helsinki Declaration. There were 680 consecutive kidney transplants that met inclusion criteria. We divided the wound complications into 2 groups: the first group included major wound complications (wound dehiscence, wound evisceration, wound infection, wound necrosis, incisional hernia, and ventral hernia), and the second group included minor wound complications (seroma, hematoma, and perigraft fluid collections). Recipient risk factors for complications included recipient age, BMI, diabetic status, albumin level, preoperative platelet level, DGF, and whether or not a drain was placed. Donor data also were collected and recorded including donor age, type of kidney transplanted (living-donor, deceased-donor, donor after cardiac death [DCD], or expanded criteria donor [ECD]), warm ischemic time, and cold ischemic time. All patients included in this review were on an immunosuppressant regimens consisting of a calcineurin inhibitor (either cyclosporine or tacrolimus), MMF, and prednisone. Information on various wound complications was collected over the first 30 perioperative days. Any patient treated with sirolimus as a part of their immunosuppressant regimen was excluded, as were patients whose data were not completely obtainable. Note that drains were placed according to the physicians’ preference, and therefore, were not randomly assigned to a drain or no-drain group. Drains were removed once output was < 50 cc in 24 hours. If the output was suspicious for a urine leak, a drain creatinine level was sent for analyses. If the output was bloody, hemoglobin levels were monitored, and symptomatic patients with bloody output were explored in the operating room. We attempted to determine whether drain placement was protective. All analyses were done with SAS for windows, version 9.2. The chi-square tests were used for categorical data, and the Wilcoxon signed rank test was used for nonnormally distributed data such as the patient’s age and body mass index. Barnard’s test was used if the underlying assumptions for chi-square test failed to hold true. Barnard’s test is a more powerful alternative than the Fisher exact test for 2 × 2 contingency tables. Propensity scores were used as an interference factor to balance potential bias between drain (D) and no drain (ND) cohorts to rebuild a randomized situation from a nonrandomized data set.30 Finally, a Hosmer–Lemeshow test was used to evaluate the final multivariate logistic regression (MLR) model fitting. At the end of study, the fitted MLR model, accounting for the unevenly distributed patient population, was used to obtain the probability of a wound complication in a patient who had a drain or not. P values < .05 were considered statistically significant. Because of the low occurrence rates of individual wound complications, seroma, lymphocele, and perigraft fluid collection were combined as a new variable: minor wound complications. Wound dehiscence, hematomas, evisceration, infections, wound necrosis, incisional hernias, and ventral hernias were combined as another new variable: major wound complications (Figure 1). Six hundred eighty kidney transplants were performed from 2001 to 2008 which met the inclusion criteria. 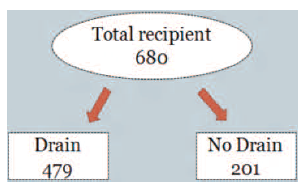 Four hundred seventy-nine had a drain placed at the time of transplant compared with 261 patients who had no drain placed (Figure 2). Table 1 summarizes the wound complications for the cohort. Seventy-eight of 479 drain patients (16.28%) and 24 of 201 no drain patients (11.94%) had a wound complication. Wound infections were seen 3.97% of patients (19/479) with a drain, compared with 1% of patients (2/201) without a drain. Necrotic wounds occurred in 2 patients with a drain (0.42% vs 0%). Wound dehiscence was noted in 1.46% of the drain patients (7 of 479) compared with 1% of the no drain patients (2 of 201). One patient in the drain group had an evisceration (0.21% vs 0%). Incisional hernias were observed in 6 drain patients compared with 3 no drain patients (D, 1.25%; ND, 1.49%). Ventral hernia complications were seen in 2 patients with a drain and no patients without a drain (rate, 0.42%). Seromas were seen in the drain group 8 times (1.67%) and 6 times in the no drain group (2.98%). Hematomas were seen 32 times in the drain group (6.68%) and 11 times in the no drain group (5.47%). These data were first tested for normality for all risk factors. Next the Mann-Whitney U test was applied to all nonnormally distributed variables. For the normally distributed variables, the chi-square test was used. Otherwise, Barnard’s test was an alternative test for 2 × 2 contingency table. Table 2 shows that there is enough statistical evidence to suggest that the distributions of the patients’ age, diabetic status, patient’s albumin level, preoperative platelet level, lowest postoperative platelet level days 3 to 7, warm ischemic time, DGF, and donor BMI are significantly different between drain and no drain cohorts at alpha level of .05. Demographic analyses revealed that the drain group had a higher average value in recipient age, donor BMI, and recipient BMI. The drain patients had a lower albumin and a lower mean platelet count in the drain group after surgery. The number of patients without diabetes in the drain group numbered nearly twice as many as those in the no drain group (Table 2). Analyses were performed on the rates of wound complications between the drain and no drain groups using the chi-square test on the variables minor wound complications and major wound complications (Table 3). Minor wound complications were observed in 9 patients in the drain group (1.88%) and 6 patients in no drain group (2.99%) (P = .3702). Major wound complications were observed in 58 patients in the drain group (12.18%) and 17 in the no drain group (8.46%) (P = .1655). Many risk factors are not evenly distributed between the groups. An attempt to normalize the groups using a propensity score was made. Table 4 shows the fitted MLR model on wound complications adjusted for the propensity score. There were 3 predictors that met the criteria of significance (ECD, DCD, and DGF). As Table 4 indicates, drain placement is not one of these significant predictors, because the variable drain was excluded by the stepwise selection. The result of Hosmer–Lemeshow test showed that there is no evidence of a lack of fit in the selected model (P = .5880). Therefore, there is a statistical suggestion that the logistic model is appropriately fit. Based on the above model, the association between drain placement and wound complications, while adjusting for the other potential risk factors, can be assessed. The data analyses demonstrated some evidence that drain placement is not associated with wound complications. Even when a randomized environment was constructed for this cohort, and the well-known risk factors are accounted for in the logistic regression model, drain placement was shown to have no effect on wound complications. The demographic data indicate that sicker patients and those at higher risk of developing wound complications received a drain (Table 2). 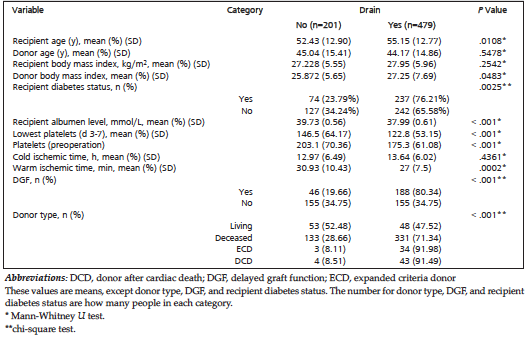 It also shows that in our institution, patients who developed DGF were more likely to have had a drain placed (P < . 001), and patients with diabetes (P = .0025), a well-established risk factor for wound complications, were more likely to have a drain placed.11-13,25-29 Also, Table 2 shows that patients with low preoperative platelet counts were more likely to be assigned to the drain group (203 compared with 175 for ND and D groups) (P < .001). Fong and associates stated that the placement of a drain after an elective liver resection leads to no difference in outcomes for hospital stay, mortality, or complication rate, and while not significant, the only wound infections that were noted were in patients with a drain. Gurusamy and associates found that drain placement after an uncomplicated open or laparoscopic cholecystectomy resulted in significantly more wound infections and no difference in the rates of mortality, bile peritonitis, total abdominal collections, abdominal collections requiring treatment, or infected abdominal collections.22,24 Our results agree with these reports. To adequately assess for the effect of drain placement on wound complications in our cohort of patients whose risk factors were not distributed evenly, the data set was normalized by the propensity score for established risk factors. An MLR model using the propensity score was created to account for this uneven distribution of risk factors and potential bias between the drain and no drain group. The risk factors that were found to be significant in the MLR model were ECD, DCD, and DGF (P = .017, .0431, and .0067) (Table 4). These factors are recognized as known risk factors for wound complications. Delayed graft function results in increased allograft immunogenicity and is associated with an increased risk of acute rejection episodes and decreased long-term survival.32 Expanded criteria donor and DCD are higher risk donor groups that have been shown to have higher incidences of DGF. It is not surprising that the MLR identified these factors as risk factors for wound complications because these patients had more risk factors for developing wound complications (Table 2). Seventy-one percent, 92%, and 91% of deceased donors, ECD, and DCD patients received a drain. Even though more drains were placed in these high-risk patients, there was no correlation between those that received a drain and those that had wound complications in this study. Despite our model agreeing with other studies finding ECD, DCD, and DGF as risk factors for wound complications, it is interesting to note the many known and accepted risk factors for wound complications were ruled out by our MLR model. For instance, recipient BMI is a well-known risk factor for poor wound healing and was not found to be significant by the propensity score. This shows that placing a drain in higher BMI transplant recipients has no effect on wound complications. Another notable risk factor excluded by our MLR model is nutritional status. Albumin is a known indicator of nutritional status.9,10 It is known that low preoperative albumin levels are risk factors for wound complications.9,10 As shown in Table 2, albumin was a category that was unevenly distributed between the drain and no drain groups before the regression modeling. Although patients in our cohort with poorer nutritional status were more likely to have had a drain placed (P < .001), our final model did not reveal low preoperative albumin levels as a significant risk factor for developing major or minor wound complications. This could mean that placing a drain in a patient with a low albumin level may have no effect on the rate of wound complications. This study’s findings were congruent with Valente and associates who reported that diabetic status did not correlate with wound complications. However, many other studies have noted diabetes as a significant risk factor for wound complications.11-13,18 After stepwise selection, diabetes status did not show significance in the final MLR model in this study, which means that diabetes status had no correlation with major or minor wound complications in our cohort of patients. 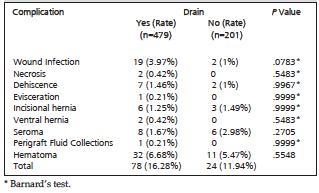 The majority of diabetic patients (76.21%) had a drain placed in this study (Table 2). At first glance, we could speculate that drain placement is responsible for the decreased rates of wound complications in our study compared with others, but when we used the MLR model to account for the preference, our center showed toward placing a drain in patients with diabetes, that it was still excluded by the stepwise selection for wound complications (Table 4). This could mean that drain placement does not affect the rate of wound complication in patients with diabetes and is therefore unnecessary. There are many drawbacks to this report. It is a retrospective evaluation subject to established weaknesses. Because our center did not have set criteria for when a drain was placed, this caused more drains to be placed in patients with known risk factors for poor wound healing and at increased risk of infection. This makes it difficult to assess the pure effect a drain has on a given patient population. However, we believe that our complex statistical analysis corrected for this uneven distribution. Another shortcoming of this study is the relatively short follow-up of 30 days. It could help explain why so many of the known risk factors for complications fell out as insignificant in our model. However, in a study looking at the effect a drain has on wound complication rates, it may not make sense to have a long follow-up to see its effect. In conclusion, placing a drain does not seem to have a statistically significant effect on preventing wound complications in kidney transplant patients on an immunosuppressant regimen that includes a calcineurin inhibitor, prednisone, and MMF. Risk factors associated with wound complications are DGF, DCD, and ECD. Mehrabi A, Fonouni H, Wente M, et al. Wound complications following kidney and liver transplantation. Clin Transplant. 2006;20(suppl 17):97-110. Tiong HY, Flechner SM, Zhou L, et al. A systematic approach to minimizing wound problems for de novo sirolimus-treated kidney transplant recipients. Transplantation. 2009;87(2):296-302. Derweesh IH, Ismail HR, Goldfarb DA, et al. Intraoperative placing of drains decreases the incidence of lymphocele and deep vein thrombosis after renal transplantation. BJU Int. 2008;101(11):1415-1419. Eufrásio P, Parada B, Moreira P, et al. Surgical complications in 2000 renal transplants. Transplant Proc. 2011;43(1):142-144. Mazzucchi E, Nahas WC, Antonopoulos I, Ianhez LE, Arap S. Incisional hernia and its repair with polypropylene mesh in renal transplant recipients. J Urol. 2001;166(3):816-819. Zrim S, Furlong T, Grace BS, Meade A. Body mass index and postoperative complications in kidney transplant recipients. Nephrology (Carlton). 2012;17(6):582-587. Ojo AO, Wolfe RA, Held PJ, Port FK, Schmouder RL. Delayed graft function: risk factors and implications for renal allograft survival. Transplantation. 1997;63(7):968-974. Hetzel GR, Klein B, Brause M, et al. Risk factors for delayed graft function after renal transplantation and their significance for long-term clinical outcome. Transpl Int. 2002;15(1):10-60-16. Guo JJ, Yang H, Qian H, Huang L, Guo Z, Tang T. The effects of different nutritional measurements on delayed wound healing after hip fracture in the elderly. J Surg Res. 2010;159(1):503-508. Tobón J, Whitney JD, Jarrett M. Nutritional status and wound severity of overweight and obese patients with venous leg ulcers: a pilot study. J Vasc Nurs. 2008;26(2):43-52. Yasuhara H, Naka S, Yanagie H, Nagawa H. Influence of diabetes on persistent nonhealing ischemic foot ulcer in end-stage renal disease. World J Surg. 2002;26(11):1360-1364. Amir O, Liu A, Chang AL. Stratification of highest-risk patients with chronic skin ulcers in a Stanford retrospective cohort includes diabetes, need for systemic antibiotics, and albumin levels. Ulcers. 2012;1:1-7. Ramos A, Asensio A, Muñez E, et al. Incisional surgical site infection in kidney transplantation. Urology. 2008;72(1):119-123. Grim SA, Slover CM, Sankary H, Oberholzer J, Benedetti E, Clark NM. Risk factors for wound healing complications in sirolimus-treated renal transplant recipients. Transplant Proc. 2006;38(10):3520-3523. Flechner SM, Zhou L, Derweesh I, et al. The impact of sirolimus, mycophenolate mofetil, cyclosporine, azathioprine, and steroids on wound healing in 513 kidney-transplant recipients. Transplantation. 2003;76(12):1729-1734. Pengel LH, Liu LQ, Morris PJ. Do wound complications or lymphoceles occur more often in solid organ transplant recipients on mTOR inhibitors? A systematic review of randomized controlled trials. Transpl Int. 2011;24(12):1216-1230. Valente JF, Hricik D, Weigel K, et al. Comparison of sirolimus vs mycophenolate mofetil on surgical complications and wound healing in adult kidney transplantation. Am J Transplant. 2003;3(9):1128-1134. Eubanks TR, Greenberg JJ, Dobrin PB, Harford FJ, Gamelli RL. The effects of different corticosteroids on the healing colon anastomosis and cecum in a rat model. Am Surg. 1997;63(3):266-269. Bitar MS. Glucocorticoid dynamics and impaired wound healing in diabetes mellitus. Am J Pathol. 1998;152(2):547-554. Fong Y, Brennan MF, Brown K, Heffernan N, Blumgart LH. Drainage is unnecessary after elective liver resection. Am J Surg. 1996;171(1):158-162. Petrosillo N, Drapeau CM, Nicastri E, et al. Surgical site infections in Italian Hospitals: a prospective multicenter study. BMC Infect Dis. 2008;8:34. Gurusamy KS, Samraj K. Routine abdominal drainage for uncomplicated open cholecystectomy. Cochrane Database Syst Rev. 2007;(2):CD006003. Gurusamy KS, Samraj K, Mullerat P, Davidson BR. Routine abdominal drainage for uncomplicated laparoscopic cholecystectomy. Cochrane Database Syst Rev. 2007;(3):CD006004. Review. Update in: Cochrane Database Syst Rev. 2007;(4):CD006004. Scott H, Brown AC. Is routine drainage of pelvic anastomosis necessary? Am Surg. 1996;62(6):452-457. Morrissey AT, Chau J, Yunker WK, Mechor B, Seikaly H, Harris JR. Comparison of drain versus no drain thyroidectomy: randomized prospective clinical trial. J Otolaryngol Head Neck Surg. 2008;37(1):43-47. Kalogera E, Dowdy SC, Mariani A, Aletti G, Bakkum-Gamez JN, Cliby WA. Utility of closed suction pelvic drains at time of large bowel resection for ovarian cancer. Gynecol Oncol. 2012;126(3):391-396. Pearl ML, Rayburn WF. Choosing abdominal incision and closure techniques: a review. J Reprod Med. 2004;49(8):662-670. Pasta DJ. Using propensity scores to adjust for group differences: examples comparing alternative surgical methods. Proceedings of the Twenty-Fifth Annual SAS Users Group International Conference. 2000;261-25:1-7. Nashan B, Citterio F. Wound healing complications and the use of mammalian target of rapamycin inhibitors in kidney transplantation: a critical review of the literature. Transplantation. 2012;94(6):547-561. Perico N, Cattaneo D, Sayegh MH, Remuzzi G. Delayed graft function in kidney transplantation. Lancet. 2004;364(9447):1814-1827. Acknowledgements: The authors report that they have no conflicts of interest, and received no funding for the study.